Each one of the 84 rooms in the Okura Chiba Hotel is specially designed for guests' comfort, with an attention to detail that ensures complete relaxation. Hotel guests can choose from a choice of rooms that include Business Single, Standard Single, Standard Twin, Deluxe Twin, Double, and Deluxe Double. Specially designed rooms for physically challenged guests are also available. The elegant atmosphere of the Hotel's restaurant, Seven Seas, blends seamlessly with the wide range of cuisine that includes Japanese, Chinese, and continental cuisine, all cooked to perfection and offering a diversity of tastes. Seats 112. Okura Chiba Hotel offers a full range of Hotel facilities that include a spa and relaxation salon on the 10th floor of the Hotel. With impressive views over the skyline, the spa comprises a heated pool, a sauna, and a private aromatherapy tub for women. For workouts, the relaxation salon offers a range of full menu of massage, facial treatments, and more. 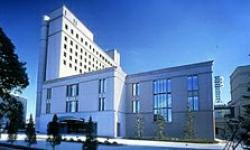 Every event at Okura Chiba Hotel is a special occasion whether it is a large celebration, seminar, or intimate meeting. With the choice of ten versatile function rooms, the Hotel can accommodate up to 485 guests for a reception and 370 for a seated banquet, with full catering facilities and impeccable service. Whatever the event, the Okura Chiba Hotel has a function room that will suit your needs. The Hotel also holds wedding ceremonies and can assist with all the arrangements for your special day. Okura Chiba Hotel is conveniently located in Chiba City and offers Hotel guests comfort, convenience, and exemplary service within a calm and relaxing atmosphere. Approximately 20 miles from Tokyo's Narita Airport and just a 13-minute drive from the Wangan Narashino Interchange off the Higashi-Kanto Expressway, Okura Chiba Hotel is also a mere five-minute walk from JR Keiyo Line Chiba Minato Station.